Andris Nelsons conducts Mozart with Lang Lang at the piano. BSO photo by Hilary Scott. The prequel to summer has been a scorching heat wave. Now it’s official, with last night’s opening night of the 2018 season of the Boston Symphony Orchestra, summer is in full swing. Andris Nelsons, in a loose, long, black silk shirt, conducted a delightful and popular program of Mozart and Tchaikovsky. In every sense it was cool in the Shed. On stage in white dinner jackets, and gowns for female players, literally, it was no sweat performing music. It was served straight no chaser to a packed Shed and enthusiastic audience. The benches at the edge of the Shed were occupied by students in the summer program. A number of the young women shrieked like groupies when superstar pianist Lang Lang crossed the stage. Before he played a single note there was a mutual love fest. With his hand on his heart he made gestures to the audience that embraced him joyously. This is not the mojo one associates with an evening of classical music. On the international circuit of musicians he is on the short list of marquee players. A native of China, he started playing piano at three and gave his first recital at five. At thirteen he won the International Tchaikovsky Competition for young musicians. He was originally scheduled to play Tchaikovsky’s First Concerto, with its bravura Romantic gestures, to open Tanglewood’s season. Instead he performed Mozart’s Piano Concerto No. 24 in C minor, which requires crisp, clear articulation. 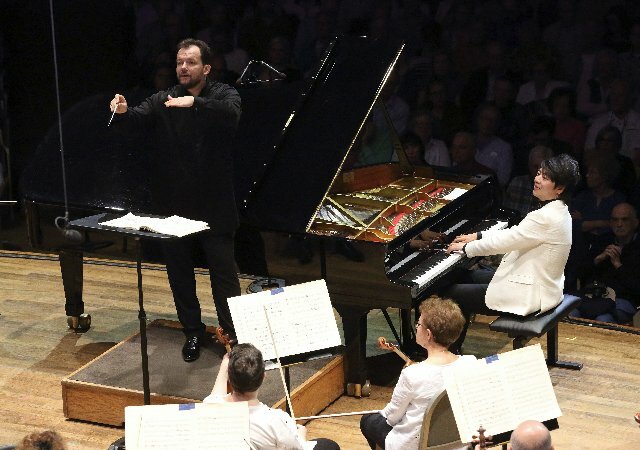 The pianist, now 36, is in great demand as a guest artist for galas and season openers as was the case in Tanglewood. There was particular audience and media interest as it was his return to performing since a pause in April, 2017. There was a long recovery from an injured left arm. That resulted from arduous rehearsal of a rarely performed and demanding work. Maurice Ravel’s left-hand concerto. It was composed for Paul Wittgenstein, a pianist who had lost his right arm during World War I. “I was not paying so much attention, I was already tiring, and I pushed to practice,” Lang told a journalist. He added that he had worked too fast to teach himself an unfamiliar, unusual work because he was on a tight deadline, with several orchestras waiting to hear if he would perform the piece with them. Scheduling his return to performing was a coup for Tanglewood. A particularly dramatic and expressive performer it is as important to see Lang Lang as to hear him perform. During passages of the piece he would arch back in a swoon. One was reminded of the sublime Bernini sculpture “Ecstasy of St. Theresa.” During other passages he bent forward hovering over and seemingly merged with the keyboard. One wondered about the response were one listening to a CD of the piece. Would it evoke the same enthusiasm as the live performance? For that we eagerly await the review of the dean of music critics, Andy Pincus, in the Berkshire Eagle. The audience was focused on what they experienced rather than the finer nuances. During ovations they wouldn’t let him go. Then there was that rarity, an encore. As the orchestra sat attentively he performed a brief but sublime Chopin Nocturne in C-sharp minor, B. 49. If possible it was even more exquisite to hear and focus on just his playing. After that he was allowed to depart with more air kisses. The evening concluded with the ever popular Tchaikovsky Symphony No. 5 in E minor, Opus 64. There was the usual chaos as the audience departed. They left richly satisfied by an evening of historic resonance. Who will ever forget that divine performance by Lang Lang?